Homestays Assessment for Bojanala Platinum District, North West Province, South Africa. The assessment of homestays in the region for 2010 and beyond was commissioned by to encourage homeowners to make accommodation available for the 2010 Soccer World Cup and other events. The purpose was also to assist participants to improve the services and hospitality offered by the homestay, thereby increasing the value for tourists and encouraging longer visitor stays, attracting higher spending visitors, as well as extending the visitor season. The scope of work included the invitation of homestay participants to take part in an assessment exercise, in order to determine the quality of their products, the training of selected participants to enhanced homeowners’ skills and the value of their product, the linking of qualifying homestays with accommodation channels for the 2010 Soccer World Cup and the resultant increase in the bed supply in the District, particularly during major events. Homestays were also assisted in marketing their opportunities via the website and information centres. 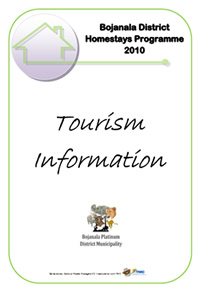 Bojanala Platinum District Tourism Master Plan, North West Province, South Africa. 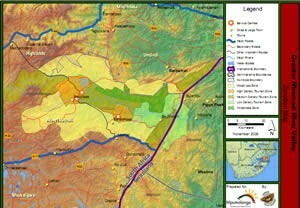 Contour were the project leaders and principle consultants. 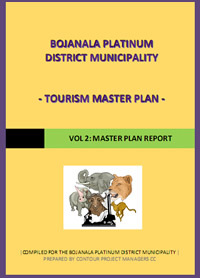 The development of a Tourism Master Plan was commissioned by the Bojanala Platinum District Municipality (BPDM) in order to assist the Municipality in identifying priority focus areas, aimed at developing the tourism industry in the District and yielding sustainable tourism developments and benefits of high quality for the area and its people. 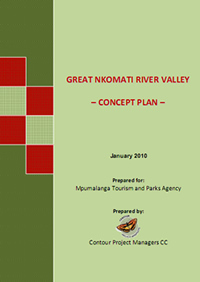 Greater Nkomazi River Valley Concept Plan for Mpumalanga Province, South Africa. 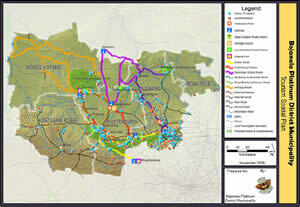 A concept for development of the Sogimvelo Game Reserve – Badplaas area as a conservation and tourism development node. Contour was appointed as lead consultant and facilitator to develop the Concept Plan. 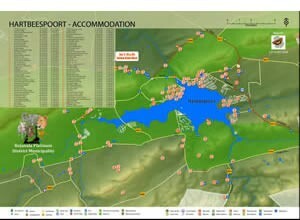 The broad vision is for the Great Nkomati River Valley (GNRV) to becom a substantial nature-based tourism and conservation destination and a primary catalyst for the stimulation of socio-economic benefits to a largely impoverished rural community, through pro-active facilitation by the Mpumalanga Tourism and Parks Agency in collaboration with the private sector, communities and the state.